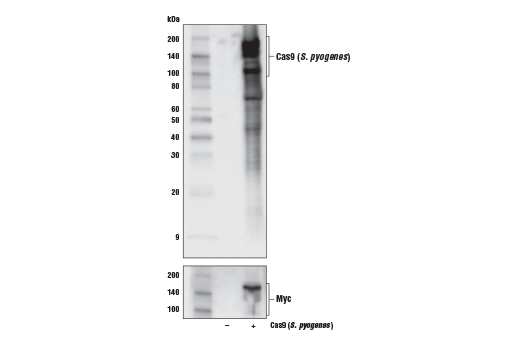 Western blot analysis of extracts from 293T cells, mock transfected (-) or transfected with a construct expressing Cas9 (S. pyogenes), using Cas9 (S. pyogenes) (E7M1H) XP® Rabbit mAb (upper) and Myc-Tag (71D10) Rabbit mAb #2278 (lower). 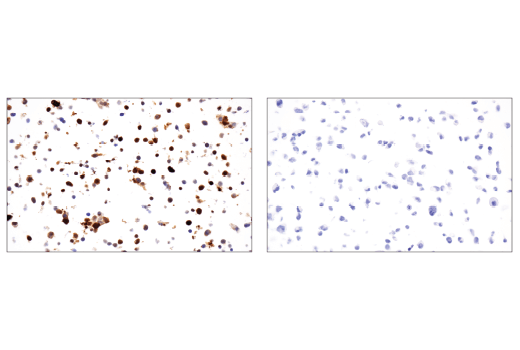 Immunohistochemical analysis of Cas9 (S. pyogenes) expression in paraffin-embedded Nprl2-deficient 293 cell pellet (left, positive) or untreated 293 cell pellet (right, negative) using Cas9 (S. pyogenes) (E7M1H) XP® Rabbit mAb. Nprl2 expression was knocked out in the Nprl2-deficient cells by transient transfection of Cas9 (S. pyogenes) and Nprl2-specific guide sequences. 293/Nrpl2 -/- cells were kindly provided by Rachel Wolfson, Lynne Chantranupong, and David Sabatini of MIT, Cambridge, MA. 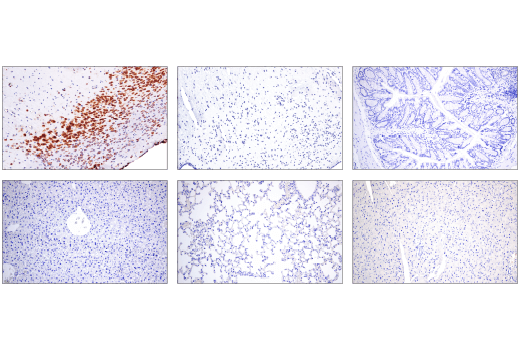 Immunohistochemical analysis of Cas9 expression in paraffin-embedded Cas9 (S. Pyogenes) transgenic mouse brain (top-left, positive) and wild type mouse tissues (negative): brain (top-center), colon (top-right), liver (bottom-left), lung (bottom-center), and pancreas (bottom-right), using Cas9 (S. pyogenes) (E7M1H) XP® Rabbit mAb. 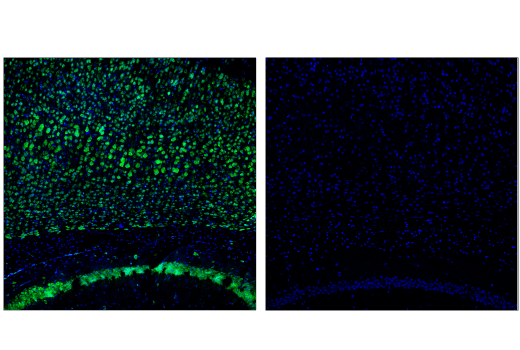 Confocal immunofluorescent analysis of brain from constitutive Cas9 (S. pyogenes)-expressing mice (left, positive) or wild type mice (right, negative), using Cas9 (S. pyogenes) (E7M1H) XP® Rabbit mAb (green). Samples were mounted in ProLong® Gold Antifade Reagent with DAPI #8961 (blue). 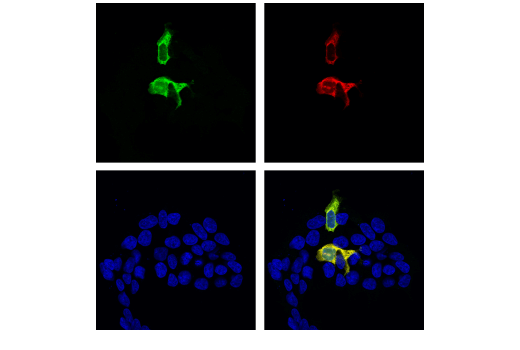 Confocal immunofluorescent analysis of 293T cells transiently transfected with a myc-tagged Cas9 (S. pyogenes) construct, using Cas9 (S. pyogenes) (E7M1H) XP® Rabbit mAb (green) and Myc-Tag (9B11) Mouse mAb #2276 (red). Colocalization of green and red signals appear yellow in the composite image (bottom-right). Samples were mounted in ProLong® Gold Antifade Reagent with DAPI #8961 (blue). Flow cytometric analysis of 293 cells, untransfected (blue) or transfected with Cas9 (S. pyogenes) (green), using Cas9 (S. pyogenes) (E7M1H) XP® Rabbit mAb (solid lines) or concentraion-matched Rabbit (DA1E) mAb IgG XP® Isotype Control #3900 (dashed lines). Anti-Rabbit IgG (H+L), F(ab')2 Fragment (Alexa Fluor® 488 Conjugate) #4412 was used as secondary antibody. 20X Phosphate Buffered Saline (PBS): (#9808) To prepare 1L 1X PBS: add 50 ml 20X PBS to 950 ml dH2O, mix. Adjust pH to 8.0. NOTE: Application of traditional antigen retrieval procedures to fixed-frozen tissues may result in excessive liberation of sections from the slide. It is highly recommended that users pre-treat glass slides with a reagent that promotes tissue adherence. (e.g., HistoGrip™) while reducing retrieval temperature to 70°C. Section tissue at a range of 6-20 µm and place on positively charged slides. Bake on a slide warmer at 60°C for 1 hour (this helps sections adhere to slides). Submerse slides in 1X citrate unmasking solution, heat in a microwave, and maintain a temperature of ~70°C for 20 minutes. Cool slides on bench top for 30 min. Rinse sections briefly in 1X PBS. Incubate specimen in fluorochrome-conjugated secondary antibody diluted in Antibody Dilution Buffer for 1-2 hr at room temperature in the dark. 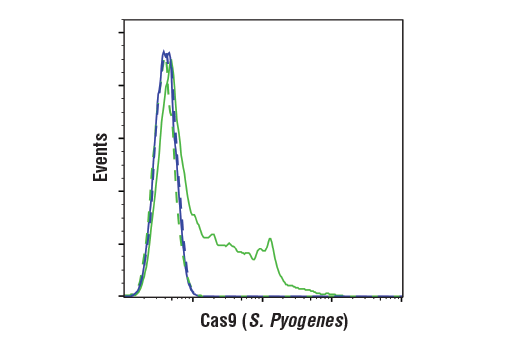 Cas9 (S. pyogenes) (E7M1H) Rabbit mAb recognizes transfected levels of total Cas9 (S. pyogenes) protein. This antibody does not cross-react with Cas9 (S. aureus), FnCpf1, and AsCpf1 proteins. Monoclonal antibody is produced by immunizing animals with a synthetic peptide corresponding to residues surrounding Leu833 of Cas9 (S. Pyogenes) protein. The CRISPR associated protein 9 (Cas9) is an RNA-guided DNA nuclease and part of the Streptococcus pyogenes CRISPR antiviral immunity system that provides adaptive immunity against extra chromosomal genetic material (1). The CRISPR antiviral mechanism of action involves three steps: (i), acquisition of foreign DNA by host bacterium; (ii), synthesis and maturation of CRISPR RNA (crRNA) followed by the formation of RNA-Cas nuclease protein complexes; and (iii), target interference through recognition of foreign DNA by the complex and its cleavage by Cas nuclease activity (2). The type II CRISPR/Cas antiviral immunity system provides a powerful tool for precise genome editing and has potential for specific gene regulation and therapeutic applications (3). The Cas9 protein and a guide RNA consisting of a fusion between a crRNA and a trans-activating crRNA (tracrRNA) must be introduced or expressed in a cell. A 20-nucleotide sequence at the 5' end of the guide RNA directs Cas9 to a specific DNA target site. As a result, Cas9 can be "programmed" to cut various DNA sites both in vitro and in cells and organisms. CRISPR/Cas9 genome editing tools have been used in many organisms, including mouse and human cells (4,5). Research studies demonstrate that CRISPR can be used to generate mutant alleles or reporter genes in rodents and primate embryonic stem cells (6-8).